Growing up in Hawaii where there are no “seasons”, I am very fascinated by the changing of the seasons. The fact that the leaves turn multiple shades of reds and oranges before browning and falling off the tree is magical to me. When I lived in Wyoming there was a place a couple of my friends and I would always ride to when Fall came along. It was a sort of small valley or “draw” as they call them out there and it was lined with bunches of Aspen trees. These Aspens were some of the few trees in Wyoming and when Fall rolled around they transformed into trees on fire, giving off colors so beautiful it looked like a Tim Cox painting. It was a picture I’ll never forget. 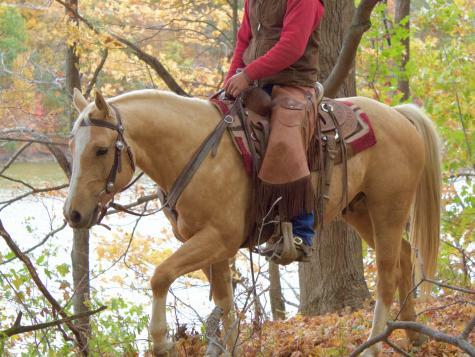 Chad, I and our friend Jake went on a beautiful Fall trail ride at Alum Creek State Park. 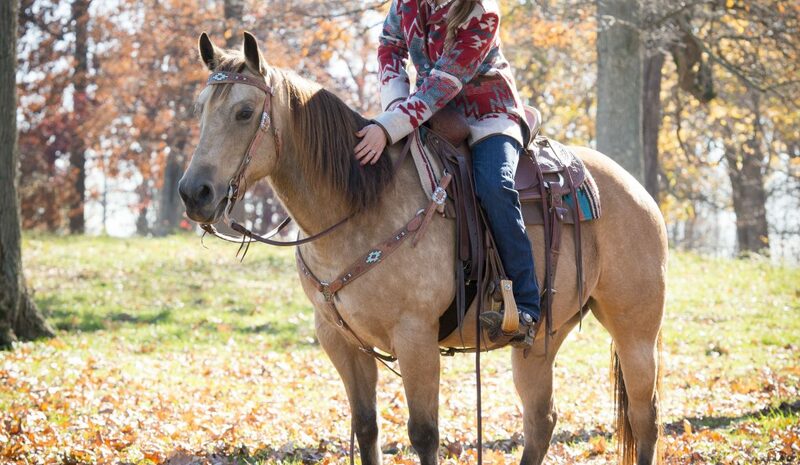 We were all riding our DM sale horses (oh, thanks Jake for riding one of our ponies!). It was a crisp morning………ok, I’ll be honest I was wearing my winter coat. We were the only ones there, the brown crunchy leaves covered the trails and the sun was shining off the lake. It was an ideal Fall day! Fall trail riding in Ohio. 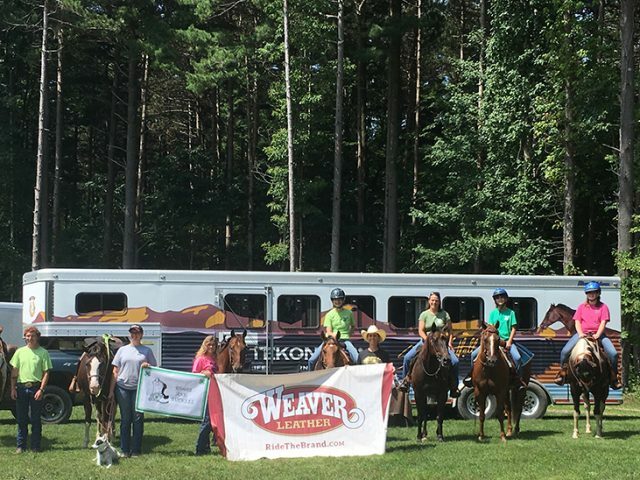 Weaver Leather Team Weaver members, C and C Horsemanship. 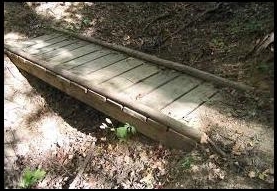 trail obstacle training opportunity with wooden bridge. Now, living in Ohio the changing of the season is more obvious and even more exciting to me! We have been taking every chance we can to go riding and getting our horses outside before Winter hits and we are confined primarily to an indoor arena. You’re probably wondering what in the world my musing has to do with horses or training in any way?? I’m getting there I promise! In all these instances and more, I’ve been beginning to notice a common problem with horses and riders. With the cold air, the stronger breeze, and the eerie feeling cooler weather brings, horses can tend to be more “alert” then usual. Perhaps cinching up tight, spooking more and snorting at imaginary monsters hiding in the trees alongside the trails. Riders can become more wary, more stiff and also more jumpy in response to their horses. Eavesdropping on other riders’ conversations discussing their day’s ride, I’ve picked up on a common response, “Well, any day I stay on is a good day!”. That can’t be good! How do you change this? As we were riding along, the trail would come across these wooden bridges covering ditches and marshy spots on the trail. We came across bridge #1 not long after starting down the trail. It was over a rather large, deep and wide gully. The trail was narrow to it and narrow leading off. Built with basically planks and 2x4s with no sides on it, the bridge dropped off on both sides. Now on this ride Chad was riding one of our greener horses, Amarillo, without a ton of outside riding experience. Amarillo was not impressed by this bridge! To be honest none of them were. Snorting and blowing, they all did the Cotton-eyed Joe from side to side a couple times before continuing forward with quite the pep in their step then they had before, but they crossed the bridge. Phew. We all started breathing again. Glad that was over. Continuing down the trail we picked back up our lively conversation and oohed and ahhed at the beautiful scenery. Wooden bridge horseback trail riding crossing (obstacle) at Alum Creek State Park in Ohio. Suddenly, the lead horse stopped in his tracks. What now? Another bridge. Of course. Why wouldn’t our relaxing trail ride be interrupted more then once with obstacles our horses would much rather refuse? Thankfully, this bridge was on flat ground; it was only making an “easier” path over some muddy marshy ground. “Yeah right, an easier path” I thought to myself, “I’d rather walk through the mud then try this scary bridge again. 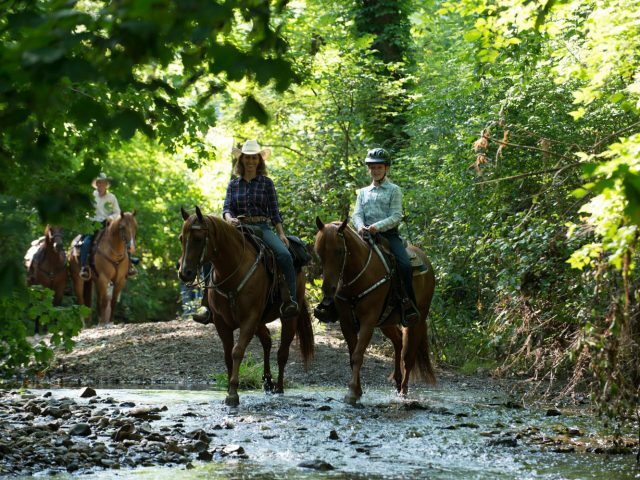 I don’t want to deal with this now, we are supposed to be on a fun trail ride.” I took my horse around. Perfect. We can all go around and not start any fights. If we don’t attempt it, they will never know the difference. Don’t we all do this? Take the easier path rather then making our horses face the obstacle, and quite literally “get over it”? It is such a bad habit that even horse trainers are guilty of. Instantly regretting my choice and knowing that I know better, I turned back to find Chad pointing Amarillo right at the bridge. “This horse needs to learn to go where I want him to!” He said out loud, looking up at me. Then urged his horse forward. Jake and I moved our horses out of the way and got comfy as we watched the horse trainer go to work. That palomino started out in every direction BUT forward. He’d put a foot on the bridge then jump dramatically off the side. Chad would correct him by turning him towards the obstacle and without a hesitation go right back to where he asked the horse to put a foot on the bridge. Again, Amarillo puts a foot on the bridge, a hesitation longer then the first time so Chad released him, but not before leaping to the other side of the bridge this time. Again…Chad corrected him. This went on for several attempts. “Well, any day I stay on is a good day!” I continued to mull this over as I watched Chad work with his horse. This is the result when people allow their horses to “go around” just like I did! Because remember, if you don’t attempt it they’ll never know the difference, right? Yeah, but then you come across something like bridge #1 we encountered and there’s no way around it. I’ve always admired the determination in Chad’s training. So I determined then and there, I too would Fix It When It Happens. “It” meaning the problem, the obstacle, the reason some of us “don’t have a good day”. So many times riders can be driven to the mindset of, “I’m scared of my horse when he’s scared.” And, “I just won’t ride him outside anymore, it’s just safer and easier to stay in a controlled environment.” Where’s the fun in that?! There’s also the mindset that “If I close my eyes and hold on really tight, I’ll be okay.” Any day I stay on is a good day, right? We don’t want to start a fight, let’s just let him do what he wants. It even drives people to the excuse of “Oh, there’s no time or room to train on him when on a trail ride.” With the exception of obvious unsafe conditions, this statement is almost always irrelevant. You can always train on your horse in a situation, just find the situation as an opportunity to do so. I turned my attention back to Chad. His patience, diligence and determination had paid off. By sticking to it and correcting and releasing at just the right moments, Chad had Amarillo crossing that bridge from left to right, forwards and backwards. 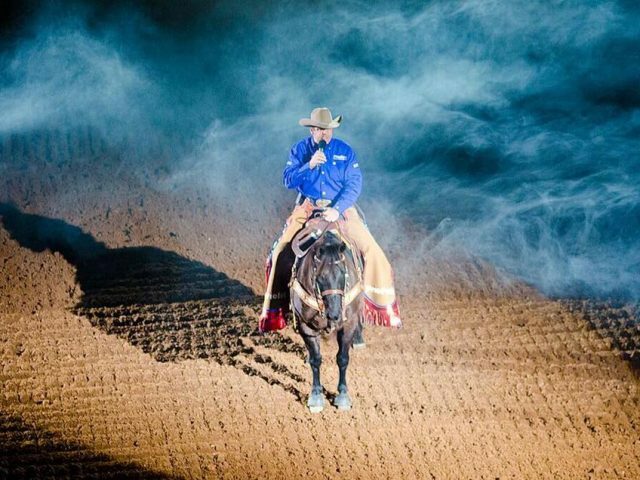 When we sell these horses we tell people “they have seen everything, and will go over anything.” We strive to make those statements true, or we won’t claim them. But it takes the training at the right moments to make it happen. The determination and the dedication. By the end of the day all three horses were crossing the bridges with ease and without hesitation. They were as relaxed as we were!! And all it needs to take is time to correct the problem and Fix It When It Happens. Don’t let a ride when “staying on is a good day”. Make every ride a good day! I do not know for sure but I believe every horse owner out there is guilty of this at one time or the other. For sure I am guilty of doing this a few times. Fixing it when it happens is the right thing to do even if it does take a little more time, it will produce many positive outcomes that can be added to the list of accomplishments for horse and rider. More confidence is another reward for fixing it as it happens and this technique should be in everyone’s training session, for we all know anytime we are working or riding the horse we are training that horse, hopefully with a positive outcome.